1868 Shield Nickel. Almost Uncirculated. 1883 Shield Nickel. Almost Uncirculated. 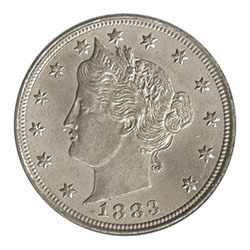 1883 Liberty Nickel. with "Cents". Uncirculated. 1938-1964 Jefferson Nickels. Uncirculated. Collection in Whitman album, complete. Very Fresh (Grey Sheet Wholesale Bid is $350). 1938-1984 Jefferson Nickels. Uncirculated. Collection in Dansco album, complete in Gem. Beautiful and exceptional (Grey Sheet Wholesale Bid is $400++) Rare this nice! 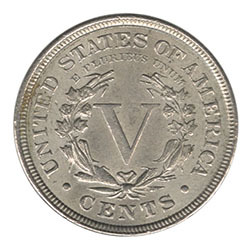 1938-65 Jefferson Nickels. Uncirculated. Collection in Dansco Album, complete. Very pretty collection (Grey Sheet Wholesale Bid is $400). 1837 Liberty Seated Half Dime. No Stars, Small Date. Very Fine. 1838-1872 Half Dimes. Lot of 26, mostly different dates, mostly Very Good-Very Fine.